...we love teaching and we constantly seek to improve our skills and methods. It’s what motivates us, and we believe it is what keeps our members engaged, focused and happy. Mark Arnott is a 5th Degree Black Belt in American Kenpo Karate and has been teaching karate in studios, public and private schools in the Pasadena/South Pasadena area since 1992. The excellent SPEF programs offered him the opportunity to teach after-school and summer programs in South Pasadena for elementary and middle-school students. He was the first athletic director at The Waverly School in Pasadena, and created their first high school varsity sports program as well as teaching math and science. In an ongoing attempt to better understand and express the techniques required for American Kenpo Karate, he has written a series of manuals covering Yellow through 3rd Degree Black. 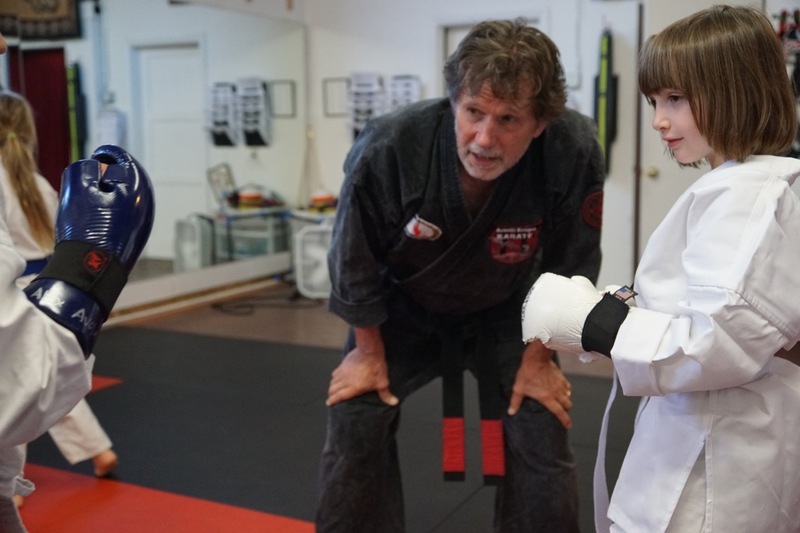 A firm believer in ongoing enrichment and education, he continues his study of American Kenpo Karate under Grandmaster Bob White at Bob and Barbara White's Kenpo studio in Costa Mesa, CA. Bob and Barbara do excellent work with their charitable foundation Royal Kids Family Camp which does amazing work helping abused and neglected children. 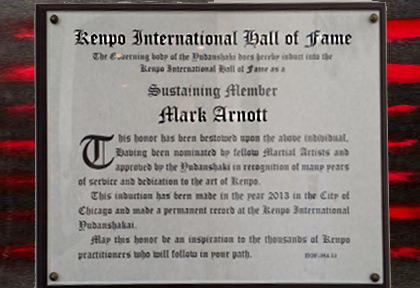 Mark Arnott was inducted into the Kenpo International Hall Of Fame in 2013 for his ongoing dedication to the world of Self Defense and Martial Arts. 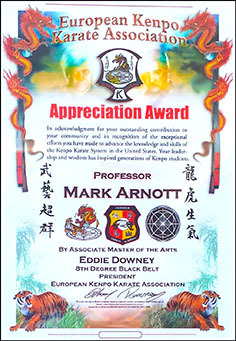 In appreciation for his work in the world of Kenpo, Mark Arnott was presented this award in "recognition of his exceptional efforts, leadership and wisdom". 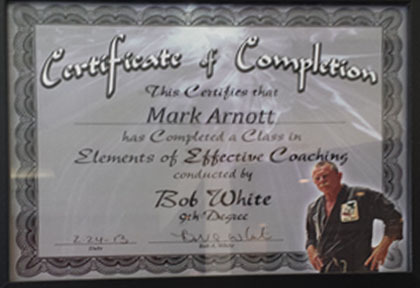 In the effort to enrich his understanding and master all aspects of training, Mark Arnott seeks out seminars, lectures and clinics. The journey on a martial arts path is not an easy one. To earn your Black Belt means you have endured moments of doubt, frustration, bruises, countless hours of training, coordination drills that sometimes make you feel uncoordinated, or worse, like your hands and feet are actively working against you. One moment you feel that thrill of mastery, but then the next day you're learning something new, and it can suddenly feel hard again. Why do it? Because if it doesn't challenge you, it doesn't change you. And Kenpo Karate changes you, makes you better. Things that were once hard, aren't hard anymore. Now you realize you're the one helping the newcomers to the art. You're looking out for them the way those who came before you looked out for you. It's not only the physical, but there is a definite mental change as well. Not only how you see yourself, but how you see other people. In the words of Master Robert Temple, early in training, martial artists are concerned with self preservation, and later, with the well being of others.